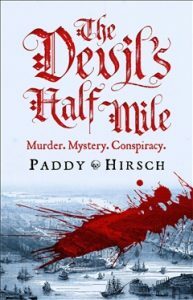 When Paddy Hirsch started out researching America’s first financial crisis, the Panic of 1792, he intended to write a history book, but as he delved deeper into the colourful but brutal world of the fledgling New York Stock Exchange it quickly morphed into a high octane murder mystery that is his first novel The Devil’s Half Mile. 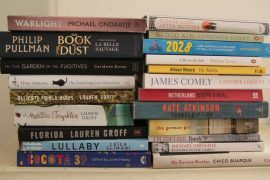 The world of fiction was the winner. Justy Flanagan has returned to his native city after initially studying Law in Ireland to Law but later lining up against the English forces in the brutal Irish Rebellion. He returns to investigate the death of his father, a lawyer who committed suicide after an investment he helped engineer went bad leaving him penniless and in debt. But his investigation soon broadens after the murder of four female slaves and an apparent link to the murky world of financial dealings on the Stock Exchange where it’s an increasingly thin line between illegal and immoral. 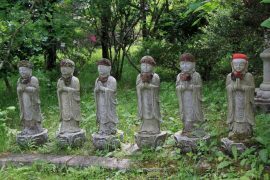 Like an onion he finds that the financial world has been built by layer upon layer of murder, greed, betrayal and revenge; even the abolition of slavery has become a lucrative business opportunity. And with each breakthrough he develops a growing list of enemies who see him as a threat to their get rich plan built on the framework of human misery. Hirsch takes the reader on a helter skelter journey through the City’s unprincipled and murderous society. No one is who they seem to be not even those to whom Flanagan is closest. All the while, Flanagan has to battle his own internal demons as he juggles his own whip-smart intellect with his growing pleasure as a skilled but casually deadly fighter. Hirsch’s detailed research is evident not just in creating an authentic feel for the city, but also through the fabulously raucous vocabulary. He kindly provides a Glossary at the end but you won’t really need it. You get the idea even if occasionally you might be slightly off anatomically. I’d be amazed if the sequel to The Devil’s Half Mile (published by Corvus) isn’t already taking shape in his computer, alongside that unfinished history book. Hirsch, who describes himself as a writer, journalist and explainer, has also published Man vs Markets, Economics Explained Plain and Simple.